I am writing to you because a good friend of mine has put the idea into my head that the klaf in my tefillin were not really tanned and therefore are not kosher. He referred me to Megilla 19a re diftera. From the research that I have done so far, it seems that the klaf that is used today is tanned only with a lime wash. On all of the tanning websites I’ve seen so far, they say that the lime doesn’t accomplish tanning but only the removal of the hair and some other pre-tanning effects. Would you be able to explain to me or refer me to a website that explains how the tanning process that is used today takes the hide out of the category of diftera? Hmm...he refers to מגילה יט that without עפצים it's דיפתרא. Maybe he should look in the first תוספות on the page that says that סיד is the same as עפצים. There are people in Israel (or maybe also in other places) that claim that our klaf is not kosher because it is not מעובד with עפצים. We in any case follow the ruling of the שו"ע that says that both עפצים and סיד are kosher. This guys friend is probably a Rambamist. There are quite a number of them today who will only use tefillin written on yemenite style klaf because the Rambam doesn't mention sid. I'm surprised he didn't mention that our klaf is also made out of the duchsustos layer according to old girsaos of the Rambam. Klaf has always been made out of the dermis layer--it was just the terminology that was confused. 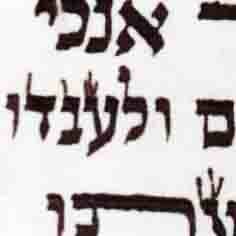 Our klaf "without the litzah" is kosher as klaf according to the Rambam provided it is properly tanned. According to the Rambam only the litzah is duchsustos. There was a whole sefer written about it called גויל וקלף. You can also take a look at my article about the topic (especially section ב) at http://klaf1.com/PAGE31.asp , and the other resources on that website. If you have any further questions feel free to contact me at hoffman.sofer at gmail. That's not what the guys at the Gvil page say. They quite insist that we are using doscostos. The issues are as follows: Rambam says "Afatazim v'hadomeh lahem". Sh.Ar. rules with Tosafot that SID is similar. Teimani poskim disagree. Although with SID, the leather is indeed converted to usable parchment, it looks and feels different from that which is processed with afatzim. Klaf made with afatzim is soft and pliable. You can crumple it in your hand and it returns afterwards to the way it was. The essential question is, what does "domeh" include? Sewcondly, we have a huge machloket as to which layer is kjlaf and which is duchsustus. Tosafot rule that the inner layer is duchsusutus and the outer layer is klaf. Different versions of Rambam either agree or disagree with this position. B.Y. says that since Tosafot is a sure thing, and we have different versions of Rambam, we go with Tosafot. However, we now know that all the early versions of Rambam say the opposite, including the Oxford Manuscript with the Rambam's signature, and all the old Yemenite manuscripts. Rav Yosef Kappah opines in his edition of Rambam that indeed, our klaf is not kosher. He goes so far as to say "we do not have tefillin today, may HaShem atone for us". Some do, today, make klaf according to Rambam (this is only since about 1990). Many poskim declare it not to be kosher as it violates. Sh.Ar. In Baruch SheAmar he brings that some towns did one and some the other, but that the correct practice is like Tosafot. OTOH, Meiri and Machzor Vitri declare all layers are kosher (this is brought in Hagaot Maimoni), opining that the statements of the Gemarra to the contrary are not halachot, but rather recommendations for practical reasons (thinner parchment to fit in Tefillin, more durable for Sifrei Torah) and hence not me'akev. It's not just Teimani poskim. The Rambam himself in the teshuvos explicitly passels parchement. See my article cited above for the exact citations. See there also regarding the layers of skin, about which there has been much confusion and misunderstanding. Also, it is not correct that the Meiri is machshir all layers of skin per se, although in Kiryas Sefer he does justify using parchment. 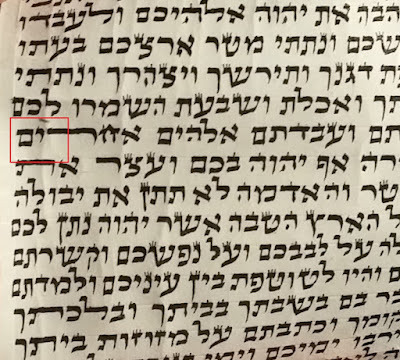 In his comments to Shabbos 79 he says explicitly that tefillin that are kosher according to the Rambam are pasul according to him and vice versa. You wrote that "many poskim declare it not to be kosher as it violates Sh.Ar." I think you are referring to using the dermis layer of the hide as klaf when you say that many poskim declare it to not be kosher. What would these poskim use for kosher sid-processed parchment since all of the sid-processed parchment that is used today is the dermis layer, as I have been reliably informed by experts in this field? I have also learned from an expert that it is not possible to make sid-processed parchment out of the litzah since it would crumble into nothing. You wrote that "many poskim declare it not to be kosher as it violates Sh.Ar." I think you are referring to using the dermis layer of the hide as klaf when you say that many poskim declare it to not be kosher. No he is referring to the opinion of Rav Kapah. Rabbi Michael Tzadok wrote that "No he is referring to the opinion of Rav Kapah." The opinion of Rav Kapach is that the dermis layer is the klaf. The many poskim that declare the dermis not to be kosher for klaf- what do they use for klaf today since the only sid-processed klaf is the dermis layer? The opinion of Rav Kapach is that the dermis layer is the klaf. No. Rav Kapah held by a variant reading of the Rambam and believed that the Dermis layer was not klaf. There are a group of his students that make "klaf" based on his reading of the Rambam. Many(most) poskim declare it not kosher because it is at odds with the Sh"A. "No. Rav Kapah held by a variant reading of the Rambam and believed that the Dermis layer was not klaf." The dermis is the thicker of the 2 layers and the one that is closer to the muscle tissue of the animal. The litza layer is the thinner of the 2 layers and the one whose outer side is covered with hair. Rav Kapah held according to all of the old Yemenite manuscripts which all say that the dermis layer is the klaf and the litza layer is the duchsustus. Most parchment today is made from the dermis without the litza, some is made with the litza still attached. I know this not from my own experience but from speaking with reliable experts in the field. The Shulchan Aruch says that klaf is made from the layer we call the litza. But parchment (sid-processed) has never been made from the litza layer because it would crumble into nothing. But the litza layer can be used if it is tanned. The SA's psak follows Tosafos that Klaf is the outer layer. Practically speaking, however, even in the time of Tosafos parchment has always been made of dermis, yet they permitted it for various reasons some of which remain unclear. They certainly were not familiar with tanned litzah being used for Klaf. One of the tanners in Israel who makes tanned "Rambam Klaf" simply takes regular klaf/parchment (without the litzah of course) and tans that. See the Kesset HaSofer Siman B Seif 8 and 9. Which rules like the Sh"A. So does the Arizal in Eitz Chaim 86d. Where he says that there is gvil and ducustus, and gvil is on the outside and ducustus on the inside. When we split the skin in two we have klaf and ducustus. See the Bei Lechem Yehuda there. La'maaseh, which side is used for parchment today for all STa"M - the inside layer, the outside layer or the meat side of the unsplit hide? The outside layer, as it is written in the Sh"A, Keset HaSofer and Eitz Chaim,and other halakhic sources. To put this into terms familiar to those who work with leather. Gvil is Fullgrain leather. It consists of the epidermis and dermis layers of the skin, though unless it is a fur, the stratum corneum has been removed along with the hair. Klaf is top grain leather in which the lower levels of the Dermis have been removed leaving only the epidermis and the stratum papilare of the dermis. duscustus is split leather. Very fiberous, and from whence we make suede and other such products. It is the lower layer of the dermis. I watched the video. He simply misrepresents several of the sources that he brings. It is also clearly against the psak of the Shulchan Aruch as well as the Keset HaSofer, Kol Yaakov, and numerous others. If we didn't split the hide the klaf would be rather thick, also the side we are writing on would be incredibly fiberous and absorbant. Klaf makers today sand the Klaf down, usually in planing machines. Those of us who also do put together batim, buy the sandings from them for fill in batim. You cannot simply read seforim and think that their references to layers of skin are the same as other Poskim, or that the understood them the same way as you do. Furthermore, you cannot assume that the Klaf-makers today are actually doing things the way you think they ought to be done based on your reading of the sources. They do scrape some down on the flesh side but the treatment in lime and pressing the water out allows the skin to be very thin regardless of how many layers of the skin are used. You cannot simply read seforim and think that their references to layers of skin are the same as other Poskim, or that the understood them the same way as you do. That statement works both ways. You are reading several sources based on your "corrected" reading of the Rambam. Corrections made by someone who was widely panned as an Apikorus by the way. Furthermore, you cannot assume that the Klaf-makers today are actually doing things the way you think they ought to be done based on your reading of the sources. Actually my understanding of how klaf is processed comes from 19yrs of leather work and leather tanning experience, and from touring klaf making facilities with Rabbanim such as Rav Ovadia Yosef and asking various questions. That statement simply is not true. All leather is processed in lime today, and then water is pressed or wrung out(depending on the finished product desired). Liming the lather is one of first steps in the tanning process. In fact liming skin actually causes it to double in thickness not thin out. A later deliming will cause to return to its original thickness however this is usually only done after the skin has been split. The correction has absolutely nothing to do with Rav Kapach. It is the reading found in all early manuscripts of the Rambam including one with the Rambam's signature attesting to its accuracy. He discusses it in his teshuvos as well as by the Ramban, Rashba, and Meiri. See the שינויי נוסחאות in the Frankel Rambam Hilchos Tefillin 1:7. R' Yehuda Sherez makes קלף מעופץ by taking regular klaf/parchment (without the litzah, obviously) and tanning that. Now according to your understanding please explain the din of these klafim. If he is simply taking the klaf and placing it in mei atzafim, it would undoubtedly be kosher. If he is removing the outer layer, then that is a problem and a posek must be consulted. "If he is removing the outer layer, then that is a problem and a posek must be consulted." If he leaves the outer layer then isn't he working with gevil and not klaf? Is this ok for tefillin? The original question of this post was specifically about tefillin. The Klaf we have today has already been split before it was delimed, that is why it is so thin. Otherwise it would be at least as thick as your retzuah on your tefillin. "The klaf we have today has already been split..."
Does this mean that the klaf we have today is the outer layer alone with no inner layer at all? Yes. The Klaf we have today is technically made from top grain leather. The bottom later, the majority of the Dermis, has been removed. Then the Rav Yehuda Sherez can't remove the outer layer because there is only an outer layer to begin with as he just takes regular parchment and tans it. I'm perplexed though because on his website (particularly the video) he says his tanned klaf is only the inner layer. There are more than just two layers to skin. The Epidermis alone has 5 separate layers, and the Dermis has two. The hide is typically split between the two layers of the Dermis. If any of the outer layers are removed(which would be parts of the epidermis) aside from the what is necessary to make the hide smooth, the hide becomes questionably kosher, and a posek needs to be consulted. "The hide is typically split between the two layers of the Dermis." Does this mean that today's typical klaf is composed of both some of the dermis (inner layer) and some of the epidermis (outer layer)? Depends on how thick the klaf is and how much they have sanded down the inner side in order to produce a good writing surface. Really you should check the kesset hasofer at the above mentioned location. "The Klaf we have today has already been split before it was delimed, that is why it is so thin. Otherwise it would be at least as thick as your retzuah on your tefillin"
most klaf today is made from shelil (unborn calf) or calf that are 1 to 2 weeks old, thy are very thin to begin with, if you were to take the skin and do nothing to it just let it dry it would be just as thin as klaf. "Really you should check the kesset hasofer at the above mentioned location." Thanks. I read it. He says that klaf isn't split anymore. This is what I've heard from other experts about today's klafim. 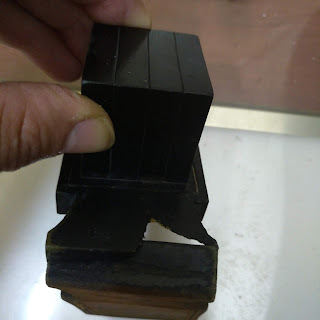 The Kesset seems to be saying that if there's any bottom layer left it would not be valid for tefillin because according to him only the bottom side of the top layer is valid for writing tefillin on. An unsplit hide, according to all opinions is posul for Tefillin. Also I don't know that an Shelil is that common. It took me quite some time to find a Klaf store that sold shelil. An unborn animal is of no commercial value, and thus those in the animal husbandry trade are unlikely to slaughter the mother and the unborn. You should read it again. He is very clear that the hide is split. Also see this for a detailed explanation. "You should read it again. He is very clear that the hide is split." Kesset 2:9 - "Our klafim, which are not split, have the din of klaf and we write on them on the meat side." "Also see this for a detailed explanation. Thank you. This page is crystal clear that today the hide is not split but instead the entire dermis layer is completely scraped away leaving only the epidermis. The epidermis layer is invalid for tefillin and sifrei Torah according to the accurate versions of the Mishneh Torah as Jeffrey Siegel wrote above- "However, we now know that all the early versions of Rambam say the opposite, including the Oxford Manuscript with the Rambam's signature, and all the old Yemenite manuscripts." regarding shelil its a lot more common then you think, here in ny we send containers full with thousands of shelil to israel to be processed.